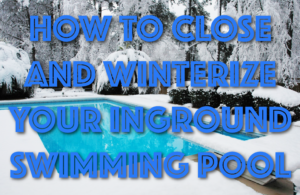 After reaping the rewards and experiencing the pleasure of your dream pool from PoolWarehouse.com, we want to help learn how to close and winterize your inground swimming pool kit. Closing it down perfectly will ensure that you experience your dream season after season with ease. Closing your inground pool kit down properly will ensure your pool will last for many seasons without repairs or replacements. There will be several things you will need before you begin the process of closing and winterizing your swimming pool kit. round. 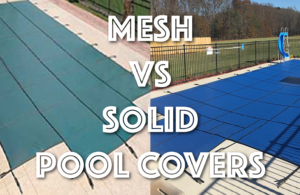 Pool Warehouse offers a variety of safety pool covers to accommodate your existing pool kit. 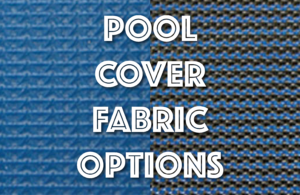 Our safety pool covers include all the necessary hardware required to install your pool cover. Feel free to contact us today for a quote! The hardware needed to install your cover includes anchors, springs, tamping tool, hex key, and installation rod. You will need adjustable winterizing slip plugs for most pool jets, such as the pool step and cozy cove jets. If you have one or more Aqua Genies in your pool kit, you will need Aqua Genie winterizing covers. If you will be using Gizmos for your standard pool skimmer, make sure to inspect them for cracks. You will need an air compressor or shop vac. swimming allows you to blow out your pool plumbing, pool pump, and pool filter. You will need pool water test strips, and the necessary pool chemicals to adjust your pool chemistry. Some of the products needed are a non-toxic pool anti-freeze, Di-Chlor shock, granular winterizing (algaecide), and sequestering agent to prevent possible staining. Once you have everything you need, you can begin the process of closing your beautiful new swimming pool kit! First, get your test strips and test your pool water. Some local swimming pool companies will test your water if you bring in a sample of your pool water. Most Local swimming pool companies that provide this service will normally provide instructions to assist you in balancing your pool water chemistry. Before you begin adjusting your pool chemicals, remove any debris with your pool vacuum and net. Use your pool wall brush to scrub the walls and floor of your pool kit. At this point, if you need to do any adjustments be sure to get the necessary swimming pool chemicals. Follow the instructions on the back of the product. Failure to adhere to the manufacturer’s instructions can result in liner fading and possible toxicity. Circulate your swimming pool chemicals through your system for at least 10 to 12 hours before backwashing your filter. Use a compressor, or shop vac to blow out any existing water in the pool skimmers filter valve and pump. Any water remaining in your swimming pool plumbing could freeze and crack your pipes, resulting in leaks and costly repairs. When bubbles are visible through the pool main drain and jets, it is safe to add antifreeze and plug your jets with the appropriate winterizing plugs. It is not necessary to dive in your swimming pool to plug the main drain. When you blow out the suction line you will see bubbles coming out of the drain, plug the pipe at the equipment pad or close the gate or ball valve quickly. This will create an air lock in the line and prevent water from entering the pipe. Use duct tape to cover any exposed pipes as well as the pool skimmer deck lid. It is stripped to follow the manufacturer’s instructions for your specific equipment. DE and sand filters need to be drained and the valve left open. Put all drain plugs with other removed items in the pump basket for easy storage. Repeat this process for pool heaters, pumps, and inline chlorinators as well. Remove your swimming pool ladders and pool handrails and store them in a dry location. Use the manufacturer’s instructions for installing your swimming pool cover properly. Generally, the instructions require placing your pool cover carefully over the pool kit so you do not snag or damage the cover. Have the cautionary label facing up. Adjust the overlap equally, this can vary from 10 to 15 inches. 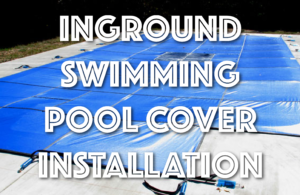 Hold the inground pool cover in place as you attach each spring to the anchors with the installation rod. Make sure straps are adjusted where the cover is tight across the entire swimming pool kit with equal tension. Now that your inground swimming pool is properly closed, you can have the peace of mind that your pool kit is safe during the freezing winter months! If you have questions on how to close and winterize your inground swimming pool kit feel free to give us a call now!